One of the hardest things to teach, in my opinion, is research. I have been teaching in a computer lab for going on five years and I have never taught research the same way twice. This is partially because I never teach anything the same way twice, but it's also because each year I learn something new. Sometimes I learn the hard way when things don't pan out the way I planned in the classroom, sometimes I learn because something I didn't plan arose and worked out well, and sometimes its due to my own self-education as I prepare to teach my annual research unit. I begin teaching research skills in third grade -- just at the time where my students' reading skills are such that they can feel successful and just at the time when they have mounds and mounds of natural curiosity. In the past, I have done your typical find-information-and-regurgitate-it-to-me kinds of projects, all in the name of teaching students how to locate information. As this year's project approached, I decided that I needed to step it up a notch. If I rail against the way standardized tests have taught kids how to regurgitate facts, then how is what I've been doing any different? This year, I took a different approach. This approach was informed by my own experiences, my own research, and a deliberate attempt to really break down the individual skills that my kids will need to be successful researchers. First, I should mention that my school does not have a library and I have actually never worked in a school here in Philly (I've worked in three buildings) that had a functioning library. That being so, all of my students will be researching using the Internet -- which has its own special challenges. I have broken the research process up into mini-lessons, which will ultimately culminate in a larger project. All of my students in grades three to seven will go through this process, with each lesson meeting them where they are and attempting to fill in gaps. When creating search terms, I use a template to help my students in all grades through the process. They use the SweetSearch search engine, which weeds out the junk they usually find on Google or Bing and which highlights their keywords and pulls text from the website into the list of search results. Each grade will differ in how they take notes and share their results. My 3rd graders will most likely stick to paper and pencil notes due to the nature of my class schedule, but they will enter their websites into a Google Form to track where they've been and what they've found. My older students will be using EasyBib to organize their links and their notes. While my third graders will not be doing true citation yet, I will be teaching citation to my seventh graders and requiring all of their projects to be accompanied by a bibliography, which they will create in EasyBib. Whew! Teaching research is a HUGE task! The SweetSearch Tutorial: Not only is SweetSearch an amazing search tool for kids, but they have some great resources here for helping digest what research is and how to approach it. Copyright Confusion Wiki: A one-stop shop for all things copyright and fair use. 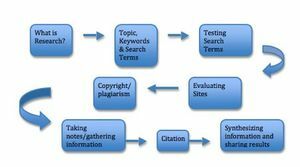 How to Do Research Another take on the research process from the Kentucky Virtual Library. Diigo for Educators A robust social bookmarking tool through which students can bookmark sites, highlight right on the site, share bookmarks with their peers and take notes on webpages. Teachers can create student accounts without needing emails. SweetSearch A kid-friendly search engine. EasyBib A robust online citation and organizing tool. Flickr Find copyright-free images with Creative Commons licenses. Search Creative Commons Find Creative Commons content on popular sites.